« Chaos or Order? No, Life! and has it always looked that way? Kabbalah Sephirots as they are placed today. It’s usually thought that it has looked like this since the day man was created many planetary cycles (aeons) ago. But, as God emanates down through his creations, his emanations three aspects (Son, Mother, and Father), ascends up through the Sephirots leading their creations up, and the placements of the Sephirots changes therefore on the pillars, after which aspect occupies a given Sephira. That is, Sephirots with the Mother aspect are placed on the Left Pillar, Sephirots with the Son aspect are placed on the Middle Pillar, and Sephirots with the Father aspect are placed on the Right Pillar. Binah, Chokmah, and Kether are placed the way they are because Binah contains The Mother, the Creator of Man (Thrones.) The Creator has to be just above the Abyss, as she is above any of our spiritual bodies. The Mother should have been in Chokmah which is a feminine Sephira, and Binah should have contained the Son, and Kether should have contained The Father aspect. While The Mother is in Binah, The Son is hidden in one of the other Sephirots, so there is missing a Son-Sephira below Kether, where Binah in reality should have been placed, and where the knowledgeable have placed an imaginary Sephira called Daat instead, symbolizing the hidden Son. We come from here to the Kabbalah of today by shifting the Æon’s one up, the Mother/Elohim moved from Tiphareth to Geburah, thereby Geburah was placed in the Left Pillar and Tiphareth moved from the Left Pillar to the Center Pillar, as the Son moved into Tiphareth, and so forth. YHVE are the letters for the Sephirots in the Third Hierarchy, Microcosm. Yod is Air, Heh is Fire, Vav is Water, and the last Heh is Earth. After the emanation of the Son, that is, today, the Elements has moved according to the Pillars. If we use the YHVE letters, Yod is fire, Heh is Water, Vav is Air, and the second Heh is still Earth. The reason are that the Right Pillar is Fire, the Left Pillar is Water, and the Center Pillar is Air, and Malkuth is always Earth. Franz Hartmann about the emanation from WHAT IS TRUE CHRISTIANITY? It is claimed that at the beginning of certain historical periods — when old religious truths are about to be forgotten, and the idolatry of form assumes the place of true religion — some great spirit (planetary) appears upon the earth, incarnated into a human form, and by his word and example impresses the old truths forcibly upon a number of receptive minds, to communicate to others, and thus lay the foundation of a new religious system, embodying old truths in a new form. It is believed that the man Jesus of Nazareth was the mortal form in which such a spirit was embodied; the latter being no less than what I believe every planetary spirit to be — an emanation from the Universal Logos or Word. A Depth of Beginning, Notes on Kabbalah by Colin Low. This document consists of slides and notes for a public talk presented at the Spirit of Peace. Colin Low. 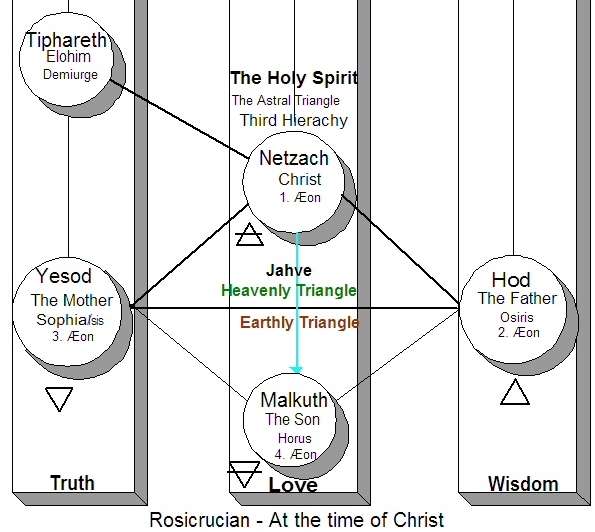 This entry was posted on October 26, 2008, 12:47 pm and is filed under Kabbalah, Rosicrucianism. You can follow any responses to this entry through RSS 2.0. You can leave a response, or trackback from your own site.